Although the fetal gastrointestinal tract is considered to be sterile [1–3], colonization of the newborn with microorganisms begins during delivery or within minutes after birth [2, 4]. Colonizing microorganisms originate from the vaginal and gastrointestinal flora of the mother, oral ingestion of breast milk and formula milk, or from environmental sources [1–4]. Among the first microorganisms detected in the stool of infants, enterococci are commonly found on the first day of life [1, 4]. While enterococci constitute part of the normal intestinal flora of humans (up to 108 cfu/g stool [5, 6]), in smaller numbers, the bacteria are also detectable in the human genital tract and oral cavity. Enterococci are considered facultative pathogens and cause a variety of infections, including urinary tract, intra-abdominal, pelvic, and soft tissue infections, bacteremia and endocarditis . In preterm infants and other immuno-compromised patients, infections with enterococci can be life-threatening . Several factors are known to influence the composition of the microbial flora in infants during and after birth [1, 2, 4]. Preterm infants and infants delivered via Cesarean section display a delayed intestinal colonization with a smaller species variability and a higher rate of potentially pathogenic microorganisms [1, 3, 4, 9]. Antibiotic treatment both decreases the amount of anaerobic bacteria and increases the number of enterobacteriaceae in an infant's stool [1, 4]. Enterococci are among the first bacteria to colonize the neonatal gastrointestinal tract. They do so within days of birth [2–4, 14]. Although a primary source for the colonizing bacteria is the oral ingestion of breast milk [15, 16], bacteria can also be derived from the vaginal and gastrointestinal flora of the mother during the birth passage . Older medical literature suggests the fetal gastrointestinal tract to be sterile [1–3]. More recent studies have shown, however, that infants may be colonized with enterococci and other gram-positive bacteria without having had direct contact with the maternal flora during delivery and before having been fed [14, 17, 18]. Jimenez at al. detected enterococci by culture after enrichment in nine of 20 cord blood samples from infants delivered via Cesarean section . In experiments with pregnant mice orally fed with a genetically labeled E. faecium, the same enterococcal strain was found in the amnion fluid by polymerase chain reaction (PCR) before the mice gave birth . A potential explanation for this finding is the transfer of enterococci ingested by dendritic cells from the gastrointestinal lumen through the gut epithelium into the circulation . This distribution pattern appears to contrast with the enterococcal species distribution causing infection in humans. 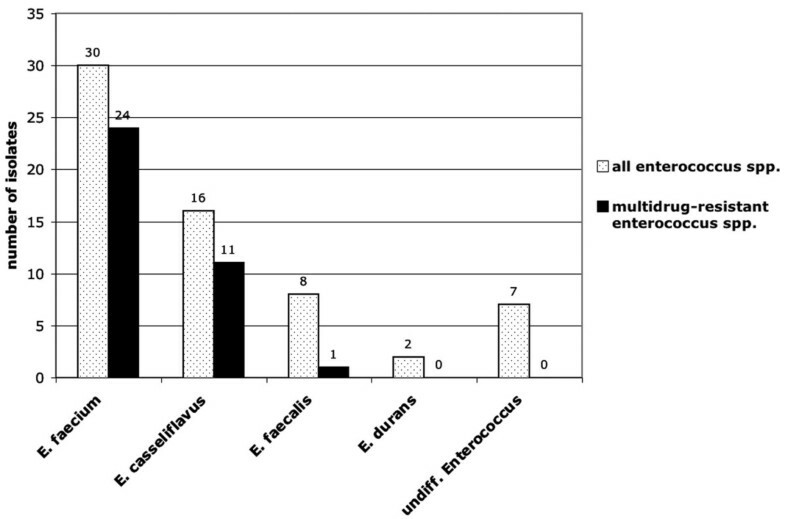 The most common enterococcal pathogen is E. faecalis, which is responsible for 80–90% of enterococcal infection, followed by E. faecium, which is responsible in 5–10% of cases . Motile enterococci like E. casseliflavus and E. gallinarum are responsible for ≈1% of all enterococcal infections [20, 21]. Immunocompromised patients have an especially increased risk of contracting infections with motile enterococci , which are part of the normal human gastrointestinal flora . 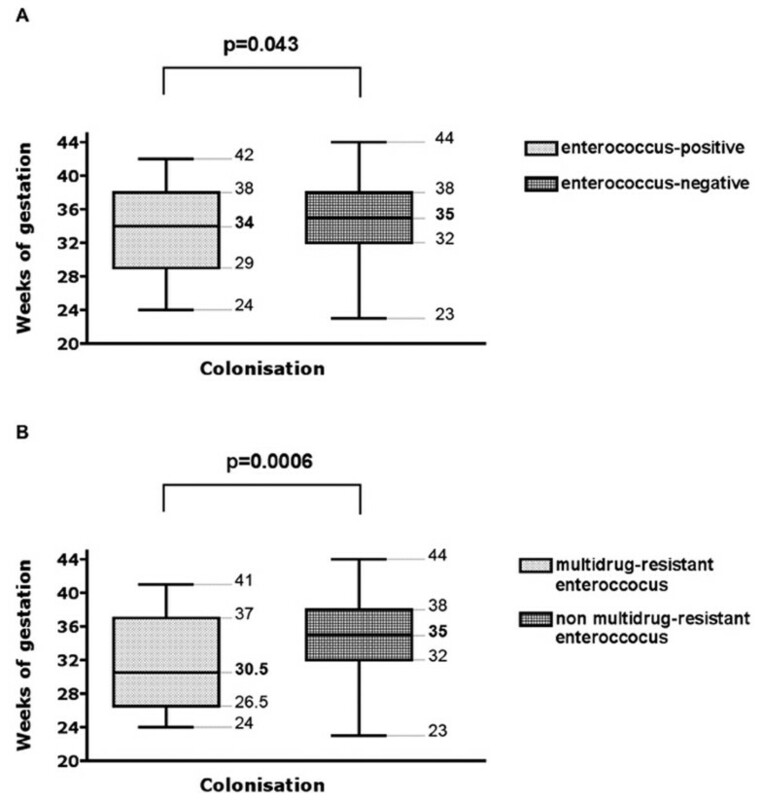 In contrast to infection rates, colonization rates of healthy humans with motile enterococci are reported to be higher (5.7% to 12.1%) . A possible explanation for the high prevalence of E. faecium strains in our cohort is the high rate of multidrug resistance. This may give E. faecium strains a selective advantage for colonization, particularly in the presence of antibiotic treatment. Eighty percent of E. faecium and 69% of E. casseliflavus isolates in our cohort were resistant to three of the five antibiotic classes tested, whereas only 12% of E. faecalis strains were multidrug-resistant. An association between the rate of enterococcal colonization and prematurity has been previously reported in the literature . In a retrospective case-control study, Miedema et al. analyzed risk factors for enterococcal colonization in 579 infants in a neonatal intensive care unit . Twenty percent of their infants were colonized with enterococci (without further species differentiation) either upon admission to the unit or else during their hospitalization. In a multiple regression analysis, prematurity, days of hospitalization, deep venous line in place, and antibiotics other than amoxicillin were independent risk factors for enterococcal colonization . Miedema's study cohort did not differentiate between antibiotic-sensitive and drug-resistant enterococci. In our cohort, both prematurity and low birth weight were predictors for early colonization with enterococci (Figure 2 and 3). This association was independent of maternal antibiotic use during pregnancy (Table 3). Two other studies have shown that maternal antibiotic treatment does not have an influence on the bacterial colonization in infants after the tenth day of life [9, 23]. Using culture methods, Gewolb et al. investigated the stool flora of 29 extremely low birth weight infants on day 10, 20 and 30 of life. The bacterial flora did not differ between infants with or without maternal antibiotic treatment around the time of birth . Using real-time PCR, Penders et al. studied the bacterial flora in stool of 1032 infants at one month of age. 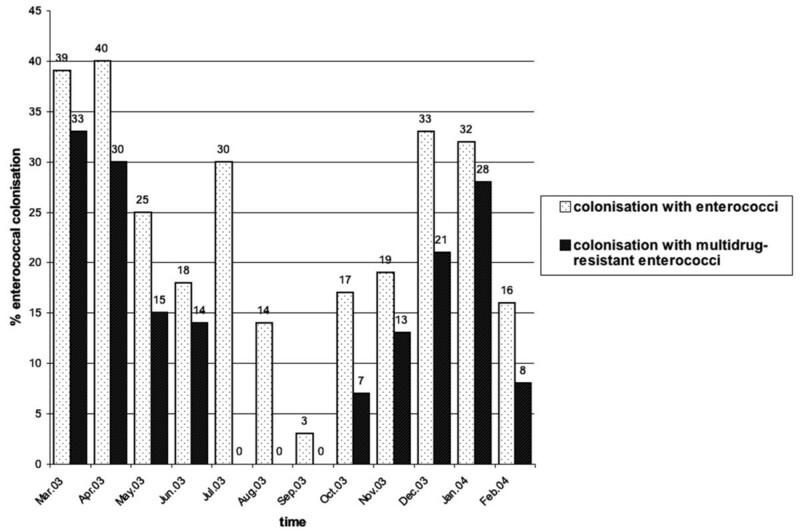 The colonization pattern they detected was independent from maternal antibiotic treatment . In our cohort, however, maternal antibiotic treatment proved to be a risk factor for infants' colonization with multidrugresistant enterococci shortly after birth (Table 3). Antibiotics used in our cohort were primarily cephalosporins (17 of 23 cases with prepartal antibiotic treatment and subsequent enterococcal colonization in infants). Because of the high resistance rates of E. coli to aminopenicillins, cephalosporins are the antibiotics standardly used by our hospital for women experiencing preterm labor. By contrast, only one pregnant woman who was treated with an aminopenicillin gave birth to an infant colonized with enterococci. Enterococci show an intrinsic resistance against cephalosporins. The use of cephalosporins may therefore be responsible for the selective advantage of enterococci in our cohort. It is unclear to us why the results of our study revealed only an association between the prepartal use of antibiotics (mainly cephalosporins) and the colonization with multidrug-resistant enterococci, but not enterococci in general – this being the case despite the fact that all enterococci are resistant to cephalosporins. The association between the use of cephalosporins and subsequent colonization with ampicillin-resistant enterococci has been previously reported in a cohort of adult patients . An explanation for this phenomenon was not provided by the authors of this study. The most striking finding of our study is the higher prevalence of early colonization with enterococci and multidrug-resistant enterococci in the winter/spring months as compared to summer/fall months (Figure 1). The same seasonal pattern was observed at our hospital the year before this prospective study was performed (data not shown). A similar seasonal pattern has been reported only in association with colonization with vancomycin-resistant E. faecium (VREF) . Bischoff et al. described the molecular epidemiology of 413 vancomycin-resistant isolates from a large urban hospital in Richmond, Virginia (USA), over a five-year period. They noted higher rates of VREF isolation during the winter/spring months. An explanation for this finding was not directly presented by their study. With S. pneumoniae, it is well documented that the prevalence of pneumococci is higher in winter [10, 26, 27]. Another recent study also noted a higher rate of penicillin-resistant pneumococci in acute otitis media cases during winter months . The authors speculate that the association may be explained by the higher rate of antimicrobial use in the population during winter because of the frequency of respiratory tract infection at that time of the year.